Mr. Tiong is on record as saying he moved to Irvine a few years ago and works as a software engineer. He has three children in IUSD schools. He has no campaign website and did not file a candidate statement with the city clerk’s office but he did make the effort to come to the Chinese Community Forum October 6. His campaign report has no contributions or expenditures. website and not a large campaign presence in the city to date. We see her signs around town. By and large, there are few indicators of an aggressive campaign organization thus far, and her campaign hasn’t raised any money according to campaign reports filed at the end of September. 2018 is Ed Pope’s first run for office. He successfully led the “No on B campaign” in June. He is an army veteran and former teacher. His lawn signs say that he is “for residents and not developers”. Pope is running with two other “No on B” city council candidates as a slate (Frank McGill, Jaci Woods). His campaign holds weekly volunteer get-togethers and has been holding ice cream socials at various parks to meet and listen to residents. Pope has attended some of the community candidate forums. He has also held neighborhood fundraisers and phone banking as another avenue to hear from the voters. He is visible in the community. Pope is not taking money from developers or lobbyists and is looking for considerable tailwind from his win on Measure B to carry the day. This last filing period, Pope raised $8,914. Friends of the Great Park PAC has received $385,000 from Starpointe Ventures and FivePoint that is destined for team Wagner. 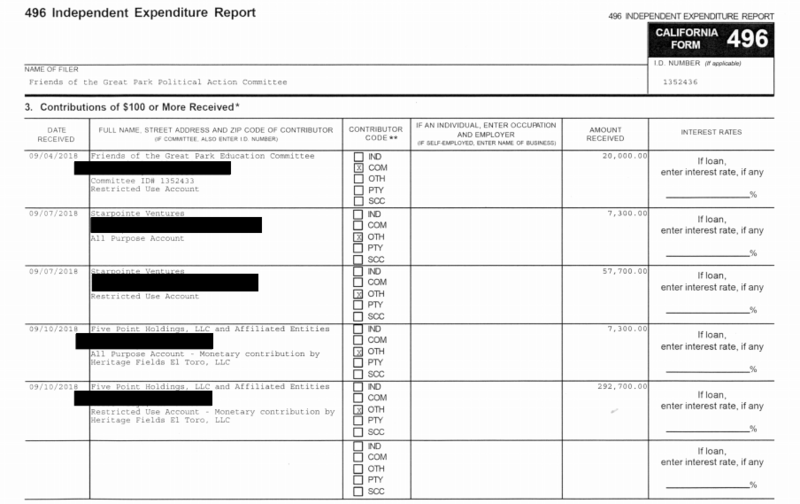 Alliance for Jobs & the Economy PAC has received $330,000 that appears to be earmarked for team Wagner. That money is from Friends of the Great Park, CA Apartment Association of Orange County, Poseidon Resources and RHW Holdings LLC (Newport Beach private equity real estate company with interests in student housing property). Wagner also raised an additional $12,579 from other donors during this period. To date, the money is earmarked towards slate mailers, digital ads, lawn signs (and people to put them up), and $130,000 to cable TV and media advertising for the mayoral race. Wagner definitely has a war chest the other candidates must envy. While Irvine Watchdog is all for candidates utilizing resources as they see fit, we can’t help but wonder if it wouldn’t be better for the residents to actually see and talk with the mayor – to discuss the issues and his record. With only weeks left in the campaign, time is running out to have this opportunity. At the last two community forums, held on Sept. 30th and Oct. 6th, the mayor was not in attendance. Why? There’s an exorbitant amount of money being funneled into the mayoral race for the incumbent. PAC money trying to influence elections yet again. Know who and what you are voting for!